Damon Iannelli is right at home in the Deep South. It’s where he’s most comfortable, where he best relates to the people. “That’s my base,” he says. Iannelli’s early years weren’t anywhere near the Deep South. Born in San Jose, Calif., he later lived in Dallas, Texas, before his family relocated to Jackson, Miss., when he was a high school sophomore. The 48-year-old hasn’t left the region since. He played baseball at Southeastern Louisiana in Hammond and coached at Southern Mississippi in Hattiesburg. So when the Colorado Rockies hired Iannelli as a scout in 1995, the territory they assigned him was, of course, the Deep South: Louisiana, Mississippi, Arkansas, Alabama and the Florida panhandle. 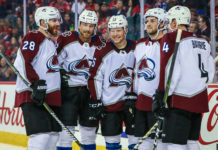 Feeling at ease with the players he’d chat up in his area, Iannelli oftentimes would ask prospects about their hobbies. This allowed many a tale to be told about fishing or hunting, or both. “Those kids down there, you go into their house and they got deer mounted all over, and largemouth bass,” Iannelli says. Or they’re fixated on the SEC. They’ve harbored dreams of donning the purple and gold of LSU, or the maroon of Mississippi State, or the red and blue of Ole Miss since their first game of tee-ball. That was before a kid named Corey Dickerson made the scout sit up and take notice. Iannelli remembers the day – a long and boring one at Smith-Wills Stadium, the old double-A park in Jackson. It’s a big field, one that was hosting a junior college tournament that day, featuring half a dozen teams. He wasn’t there to see anyone specific, but by day’s end he wanted to get know someone in particular. He’d watched Dickerson before in workouts with Meridian Community College, but never in a game. In his first at-bat, the left-handed-hitting outfielder slugged a home run. Iannelli took note. Later in the game, he clocked Dickerson running home to first in 4.2 seconds. Iannelli took note again. Speed and power, he thought, the two tools a guy’s got to have to play in the big leagues – especially at spacious Coors Field. So in between games, he gave a prospect questionnaire to the Meridian coach with specific instructions for it to find its way into the hands of Corey Dickerson. Not even halfway through that following week, the paperwork was right back in Iannelli’s mailbox, filled out and completed. The quick response was the scout’s first clue into Dickerson’s deep desire to become a pro ballplayer. Plenty of other signs came as Iannelli began following the freshman more, conversing with him after games. Every time Iannelli showed up, Dickerson hit. And every time they talked, Dickerson made clear his pro ambitions. But Iannelli wanted to get a feel for his makeup, his character, his life outside of baseball. So he asked about hobbies. 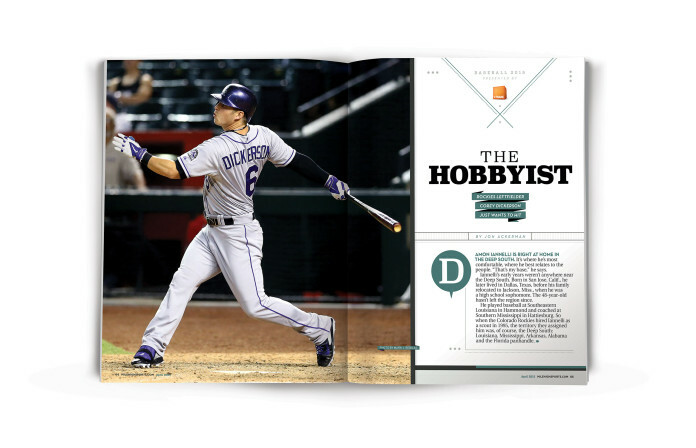 Dickerson stated his hobbies were hitting and working out. Per Iannelli, that qualified him as “a rare breed in my part of the country.” More than five years later, Dickerson hasn’t stopped hitting. And with him on deck to become the next All-Star to don a Rockies uniform, you could say things are working out. If you thought Corey Dickerson turned in a stellar season in 2014, the numbers back you up. His 24 homers and 57 extra-base hits led the squad, while his 76 runs batted in and .312 batting average (among players with at least 400 plate appearances) were second. That last stat would have ranked fourth in the entire National League had Dickerson acquired just 24 more plate appearances to reach the 502 required to qualify. Yet, as impressive as the year was (for Dickerson, not the 96-loss Rockies), he envisions greater things in 2015. The 25-year-old outfielder sees a season in which attaining plate appearances won’t be a problem. Where manager Walt Weiss will slot him into the lineup regardless of which hand the opposing pitcher throws with, and no matter where the game is being played. Dickerson looks forward to his first complete season in the major leagues. After 69 games with the Rockies in 2013, he thought the minors were a thing of his past. But a week into the ’14 season, Dickerson was optioned for the triple-A club in Colorado Springs. It turned out to be just a three-game stint before returning to the Rockies for the remainder of the year. But a part of him would have been fine staying with the Sky Sox, because there, at least, he’d receive consistent playing time. He appeared in 131 games last year for the Rockies, but only 105 were starts. Dickerson will be a starter with the big club from the onset in 2015. The Rockies think he’s ready, while the naysayers like to point out Dickerson’s splits from his breakout 2014 season. The most glaring inconsistency shows a .363 average at Coors Field and a .252 mark on the road. There’s a similar discrepancy in the lefty hitter’s line against right-handed pitchers (.328) compared to southpaws (.253). It must be noted, however, that of his 478 plate appearances, in only 98 did he face a lefty. It’s just a matter of opportunity. And being an outfielder with the Rockies, those chances are tough to come by. Dickerson was one of six outfielders to make the team’s 2014 opening day roster, but it wasn’t easy to get on the field ahead of All-Stars like Carlos Gonzalez and Michael Cuddyer, or Charlie Blackmon, who became an All-Star in 2014. Cuddyer’s now in New York, and the vacant spot is Dickerson’s to lose – which is fitting because upon calling Dickerson up for his major league debut in 2013, Weiss proclaimed, “He reminds me of a young Michael Cuddyer.” Dickerson’s emergence has helped quell the impact of Cuddy spurning the Rockies’ $15.3 million qualifying offer so he could ink a two-year deal with the Mets. Thus, Dickerson’s penciled in as the starting leftfielder, moving Gonzalez back to right, and keeping Blackmon in center. Simply knowing he had a roster spot this year, as opposed to the two years past, allowed Dickerson to spend spring training fine tuning instead thinking every hit mattered. So his spring in Scottsdale was the most relaxed ever. He worked more against left-handed pitchers. He focused on driving the ball to the opposite field. And he spent extra time honing his base running and defense. Dickerson’s favorite hobby may be hitting, but he yearns to be the complete player a manager writes into the starting lineup without second thought. So intensely did Iannelli want to see Dickerson in purple pinstripes that he actually convinced the Rockies to draft him – twice. The first time came after his freshman year at Meridian in the 29th round of the 2009 MLB Draft. 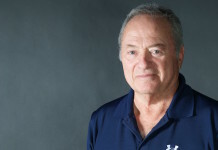 Iannelli had previously exhibited success with some of his prospects in lower rounds, so as the picks trudged on, Rockies assistant scouting director Danny Montgomery checked in with Iannelli. “Who’s your guy this year?” Montgomery asked. “McKenzie? We can’t draft nobody named McKenzie,” Montgomery said. So the Rockies did. They just didn’t have any money to offer up for a signing bonus after locking in all their other draft picks. So McKenzie stayed at Meridian. At the time, Iannelli figures he was about the only pro scout who had seen Dickerson play. That couldn’t be said by the time the 2010 draft rolled around. So when the eighth round came up, Iannelli was antsy. He phoned Montgomery. Again, the Rockies listened. And with the 260th pick, they selected Dickerson for a second time (120 picks after they took a guy named Russell Wilson in the fourth round). Iannelli was thrilled – until he received a call from Bus Cook, a man well known for being the agent of Brett Favre. He said his client, Dickerson, was wavering a bit on signing with the Rockies. Iannelli figured Mississippi State, with whom Dickerson had signed to keep open the option of college ball, was putting some pressure on his guy. So he grabbed his nine-year-old son, Joseph, and drove 45 minutes to Meridian. He wouldn’t leave until Dickerson signed, and this time he did – because this time the Rockies had some money. He received a $125,000 signing bonus and “he’s hit since the day we signed him,” Iannelli says. That he has. Within three years, he reached triple-A, where he posted a .371 average in 75 games in 2013. And nearly three years to the day after signing with the Rockies organization, Dickerson made his major league debut on June 22, 2013. Batting sixth and playing right field against the Washington Nationals, he stroked a pair of doubles in four at-bats, as the Rockies won 7-1. The hit parade didn’t continue, however, as he bounced back and forth a bit between Denver and Colorado Springs that year. But the taste of the majors convinced him he belonged for good. Corey Dickerson’s breakout 2014 earned the scout who signed him a much-deserved honor. Each scout’s association gives out an award based on players who produced in the majors, so Iannelli was named last year’s Southeast Scout of the Year. Before it was clear the Rockies would be unable to fork over much money after drafting him the first time, Iannelli wanted the kid to stay in shape. So he hooked him up with a summer travel team out of Louisiana that qualified for the National Baseball Congress World Series in Wichita. Squads were made up of amateurs and semi-pros, but in order to protect his collegiate eligibility, Dickerson couldn’t get paid. So Iannelli pulled $100 out of his own pocket to cover his prospect’s bus ride and uniform. Dickerson hadn’t played all summer, but showed up and averaged two hits a game. Iannelli asked for that $100 back this past offseason, seeing as how Dickerson’s pro career was now established. “I called him up. My son is 13 and plays on the junior high team at my local high school, and they had a hit-a-thon. And I said, ‘Alright, Corey, I want that $100 back. I want you to sponsor him,’” Iannelli says. “He sent the check the next day. So we’re even now. Dickerson’s 2014 salary was $500,000, among the lowest on the Rockies. Yet, if he keeps on hitting like he did last year, his payday will soon come. That’s good money for an odd Deep South hobby.